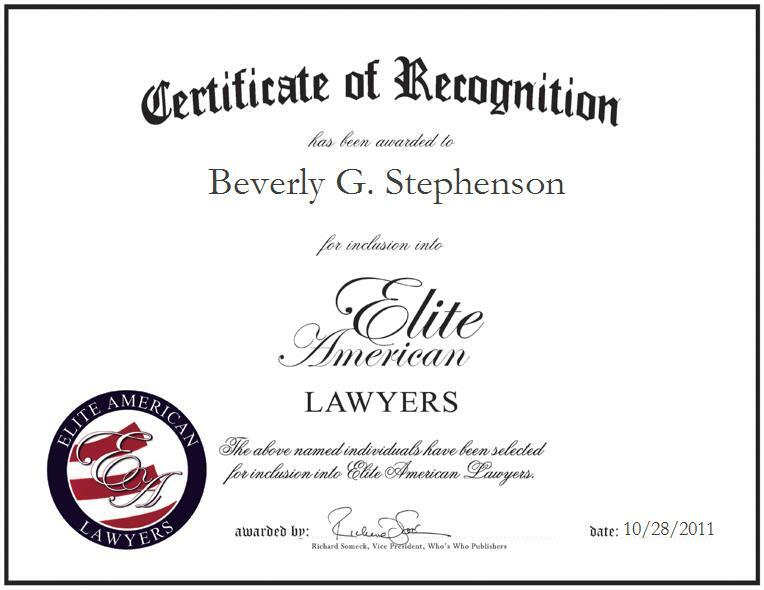 Beverly G. Stephenson is the President, Attorney and Counselor at Law at B.G. Stephenson, Ltd., a renowned provider of legal services throughout Fairfax, Virginia. He specializes in trials and appeals, and in his capacity, Mr. Stephenson defends the rights of his clients, attends meetings and conferences, interacts with clients, and files law suits which include appeals, when necessary. He handles cases concerning traffic and other matters in various courts, corresponds with clients and colleagues in Great Britain, and manages the general practice arena; he is also responsible for overseeing corporate matters. Mr. Stephenson holds more than three decades of professional experience, and he continues to strive for excellence in his every endeavor. Mr. Stephenson began law school directly after completing his undergraduate studies; he enjoys the legal field and assisting those in need of legal help. While in School, he published three comments in the Washington Lee Law Review and served as the Student Editor in his senior year. Following Law School at Washington Lee University, he was recruited by a Law Firm in NYC. Mr. Stephenson worked in NYC for a while, and then he returned to his home of Virginia. In Virginia, he opened and established his law firm, B.G. Stephenson, Ltd. As president of his company, he currently works on a variety of cases. His work in the Federal Court and appeals has yielded some of his best professional accomplishments. Mr. Stephenson is an active member of the Truro Church. He volunteers at the church and makes an investment in the youth. He is also involved in the Optimist Club International as a Friend of the Youth member. He is also active in Culture to Culture USA.